If you're a frequent visitor, you may have noticed my website has changed a bit. 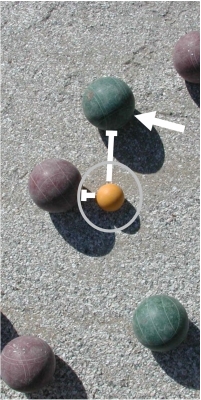 I figured I'd come out the stone age of HTML and upgrade my website so it's easier for you to navigate, read and find all the bocce information you need! 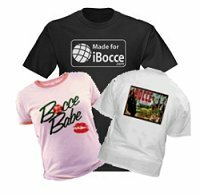 Check out the iBocce.com Cafepress shop to find the latest and greatest t-shirt designs (plus other odds and ends). They are great for gifts or just for yourself or your bocce team. Need a special shirt design, send me an e-mail and I can try to design something for you. Bocce Locations Page is Growing! Are you still trying to find a place to play bocce? Look no further, explore our Bocce Locations page for a court near you. Do you know of a court but don't see it on the list, send me an email and I will add it asap! This is the largest directory of bocce courts anywhere on the internet and I just want to keep it growing! You can help and help others find a place to play! With all the changes on the website, one more benefit will be a way to update our calendar with your bocce event! No more waiting for me to update it for you. You put it in, it updates on the spot! So get your upcoming bocce events added! 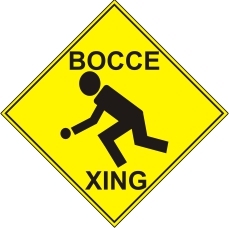 Click here to add and/or view the latest bocce events. As you may know, I built a bocce court in my backyard. I documented the process and wrote a book that you can download. I show you a step by step process on what I did and how I did it until you see the finished product. That was the year 2003 and it is still standing! Check out my diary of what I did and if you want to build your own court don't hesitate to download my ebook and build your own. Great for family functions, parties or whenever! Buy Your Own Bocce Set! Playaboule.com is our new affiliate supplying bocce ball sets as a specialty. You'll find all you need for your new set or that lost pallino! Don't hesitate, low prices and low shipping costs...go to Playaboule.com today! As well as being the author of the Budget Bocce Court, I've also been writing fiction for years. Mostly for fun or for friends. I finally wrote my first book called Clouds of Thunder. It's about a small town society that is under investigation for a bird problem. Not just any bird...a Thunderbird. I also wrote a paranormal thriller called Spectrum. A small group of college kids discover something incredible...they stumble upon a way to see into another dimension filled with angels and demons. What they don't realize that if they can see these spirits, the spirits can also see them.